With less than half the 2018-19 Provincial Junior Hockey regular season left, the Picton Pirates went a long way to cement their spot in second place in the Tod Division. Whether you are a glass half full or a glass half empty person will likely dictate how you see the Pirates results in their last three games. 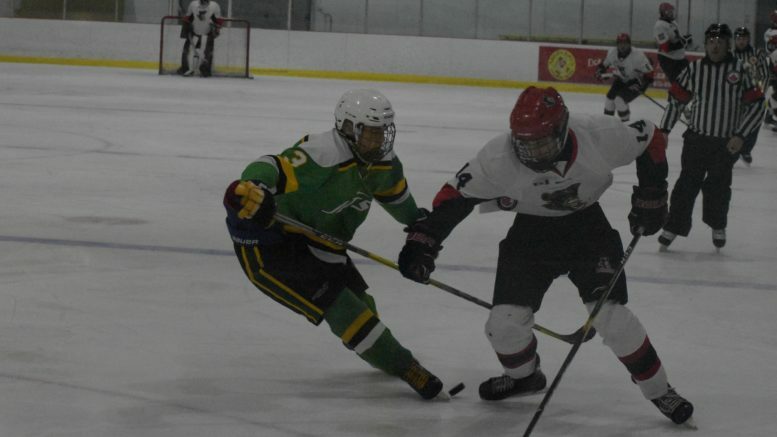 Picton opened the weekend by blowing out the visiting third place Amherstview Jets 10-4 in a key four point match up and ended buy enduring a long bus ride and blanking the host Georgina Ice 8-0. But in the middle, Picton couldn’t shake a bad start in Napanee on Friday night and fell to the first place Raiders 7-2 at Strathcona Paper Centre. Picton coach Tyler Green agreed it was truly a mixed bag for Picton (16-8-1, 33 points) in their the club kept distance between themselves and a likely first round playoff opponent in Amherstview but couldn’t gain any headway on the juggernaut Raiders who only have a single regulation loss in 22 contests and have three games in hand on the Pirates as well as a eight point lead. With it being a four point contest and with the Jets having games in hand, one would have expected a tight affair at Huff Estates Arena on Thursday but that was hardly the case. Picton’s Will Harrison staked the Pirates to a 1-0 lead just 60 seconds in and goals off the sticks of Landon McLellan and Devin Morrison in the opening ten minutes would build a spread the Jets would never challenge. Leading 4-1 after one, Picton continued to find the net with regularity and the second frame was the same as the first as Morrison bagged his second and Griffen Conger, Logan White and Tye Eaton also scored singles to make it an 8-2 game. In the third, Brayden Bertrand got his second point of the game when he set up Elliot Belzile early in the frame but 8-3 was as close as Amherstview would get. Noah Brant would make a beautiful pass to Cooper Rogers as the Pirates rearguard deposited his first PJHL goal at 7:58. Harrison and Eaton also tallied again to put Picton ahead by a converted touchdown before former Pirate Jaydon Wood in a powerplay goal in the closing minutes to make the spread a pair of field goals. On Friday, Picton would see the tables turned reciprocally only with the Raiders serving as the opposition. 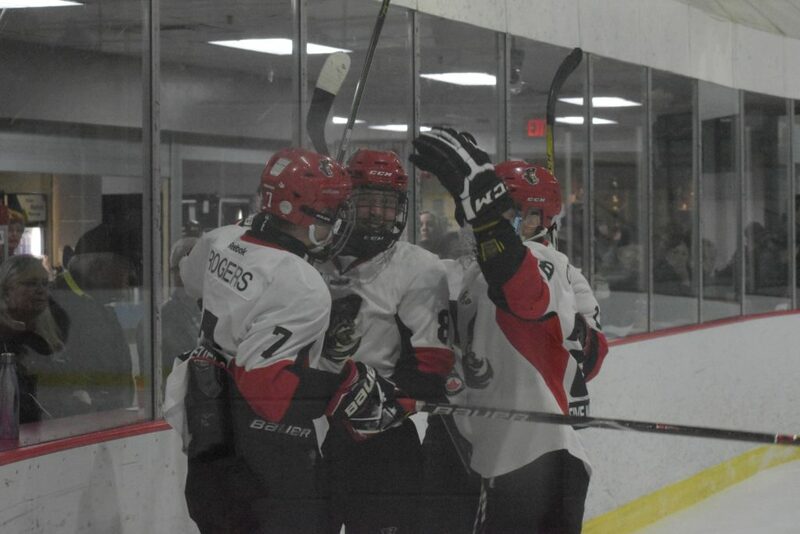 The Raiders would get out to a 4-1 lead after the first as two pairs of Raiders tallies sandwiched a Conger effort. Reid Humphrey, Cameron Harris, Curtis Marrison and Ryan Casselman all tallied for the hosts. Conger would bang home a second goal in the game in the opening 30 seconds as the former Raider converted Derek Vos’ feed to make it a 4-2 game but that was as close as Picton would come on this night. Brodie Maracle’s goal at 11:45 broke the backs of Picton and, just over a minute later, former Wellington Dukes Justyn Steven and Austin Labelle combined for a dagger to make it 6-2 Raiders. Labelle, also a former Picton Pirate, bagged another goal in the third to make it a 7-2 final. With a day off to recuperate, Picton took the long bus ride to Keswick on Sunday and showed no ill effects from the defeat at the hands of the Raiders, thumping the host ice 8-0. Brant’s goal at 4:39 of the first period would stand up as the game winner as Brennan Bush made 34 saves to pick up his second goose egg of the season. Picton was able to role the lines on Sunday and use its depth to crack the Ice time and again. Quinte AAA callup Nick Kirby-Palliser, fresh of a performance in the Major Midget Eastern Triple A All Star showcase on Saturday, scored twice for the Pirates. Green said he was happy to see the Consecon native pick up his first PJHL goal and said with the number of chances, Kirby-Palliser could have had a hat trick in the contest. Conger continued his torrid pace to the weekend, picking up a pair in Sunday’s game to give him five goals and four assists through three games. The goals against the Ice might have set a team record as they were scored seven seconds apart midway through the third period. Brant also had a pair in the game while McLellan and Poole also scored. Picton has a bit of a light schedule in the coming weeks, hosting Port Hope on Thursday and then doesn’t play until the following week when they take on Gananoque on Dec. 13. 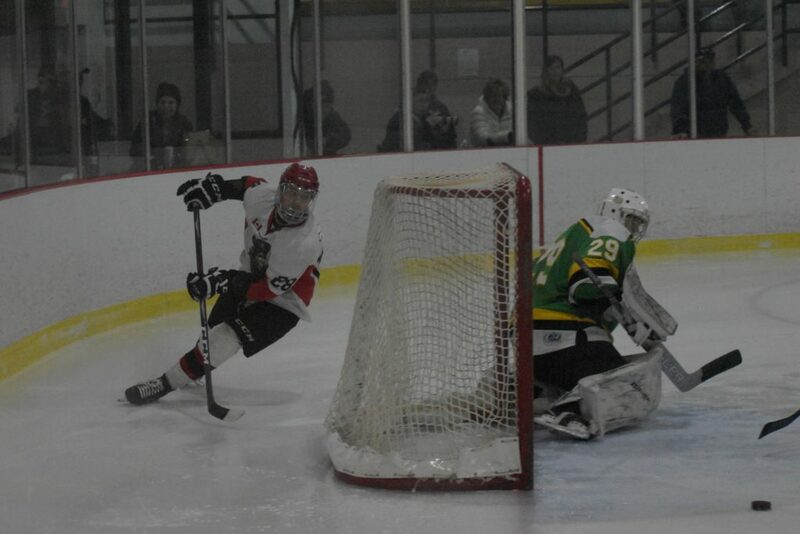 On Board with the Pirates: Conger leads Picton in scoring with 18 goals and 18 assists in 22 games. The forward has a points streak that dates back to Nov. 11 and in the eight games since Picton beat the Islanders, Conger has 18 points… Bush played all three games for Picton this weekend.